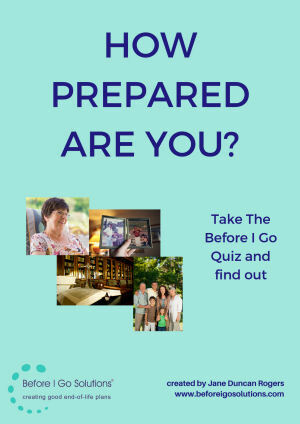 Discover if you are well prepared - or not! Find out what you need to do right now! Only 21% of people have written anything at all down about how they want their end of life to be. That's despite 79% saying it's a good idea! Find out just what you need to do right now, to bring yourself peace of mind, and save your family headache and heartache too. Thank you for signing up for the Before I Go quiz! © Copyright 2019 Before I Go Solutions. All rights reserved.